Jack took the title role. Playing opposite him was Marta Randall, one of the most attractive young ladies ever to climb the long flight of stairs from Shattuck Avenue (which, alas, is damning with faint praise). She would go on to a career as an author and teacher. The announcer was Bob Bergstresser, whose previous experience in commercial radio gave his voice just the right patina of oleaginous authenticity. And wrapping up the quartet of principal characters was Captain Conscience, an airborne do-gooder who came over (in every sense) as a cross between Superman and a Sunday School teacher — it was my ten minutes of dubious notoriety. Music Director Charles Shere wrote one of the later episodes and I polished the series off with a John-Cage-oriented conclusion from which it never recovered. I would love to be able to report that, when the series ended, the expressions of regret outweighed those of relief, but the ghost of my Captain Conscience persona would not allow it. Gluttons for punishment may now listen to all half-dozen of the five-minute episodes, complete and unexpurgated. 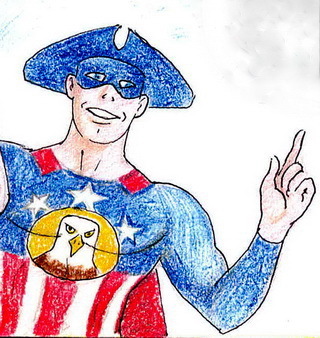 The cartoon at top right is extracted from a series of satirical drawings narrating the super-patriotic exploits of Captain Freedom. They were drawn by the late Ned Paynter, my dear friend who was News Director at KPFA in the early 60s. I posted them all in Blogspot.